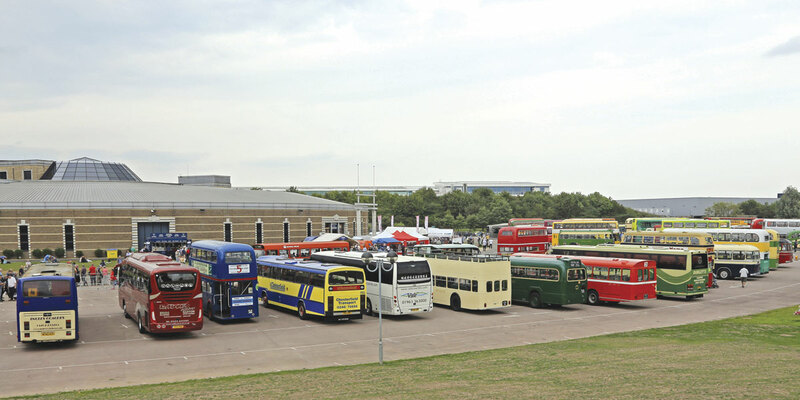 In its second year, the Buses Festival at the Heritage Motor Centre (HMC), Gaydon had to cope not only with major works taking place on and outside the site but also the vagaries of the British summer which brought periods of torrential rain by mid afternoon. Fortunately, there are plenty of covered displays within HMC itself and much of the supporting enthusiast trade fair and displays were undercover in the site’s first floor conference centre. 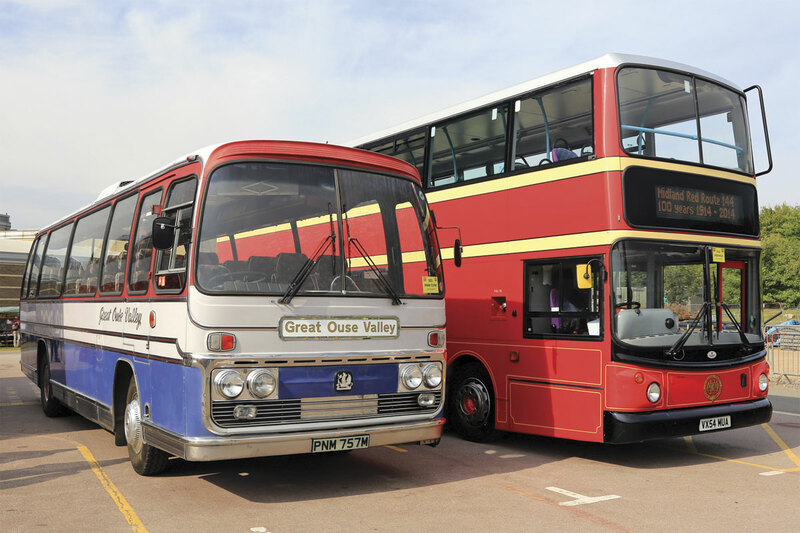 The organisers encourage a wide range of vehicles to attend the event and this year there was a 75 year age span between the oldest, a 1940 Bristol L in Western National livery and the three 15 plate vehicles. 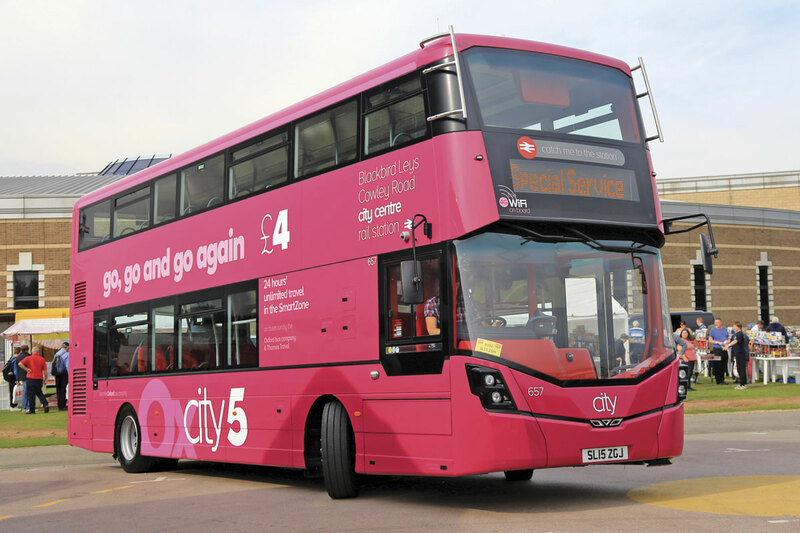 All these latest vehicles were Wrightbus products, one of the low height Streetdecks for Go-Ahead’s Oxford Bus Company, a brand new Streetlite DF for Rotala’s Diamond Bus operation and The Delaine’s final Gemini 2 bodied Volvo which belied the fact that it entered service nearly six months ago. First Group’s presence was in the form of the heritage liveried vehicles from Leicester and Worcester (Midland Red) whilst Stagecoach provided the important courtesy link from Leamington Spa using an ADL Enviro 400 and an ALX400 Trident. 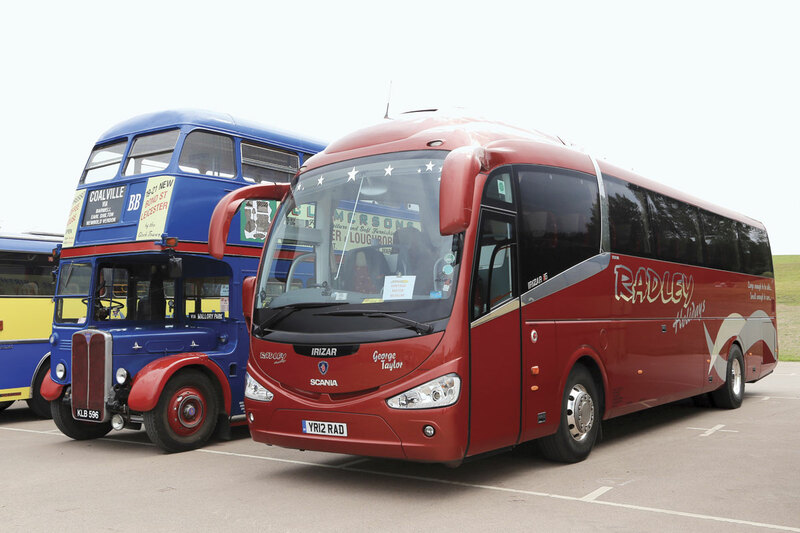 A number of modern coaches brought visiting groups including a 12 plate Irizar i6 bodied Scania from the Radley Holidays fleet in North Lincolnshire. 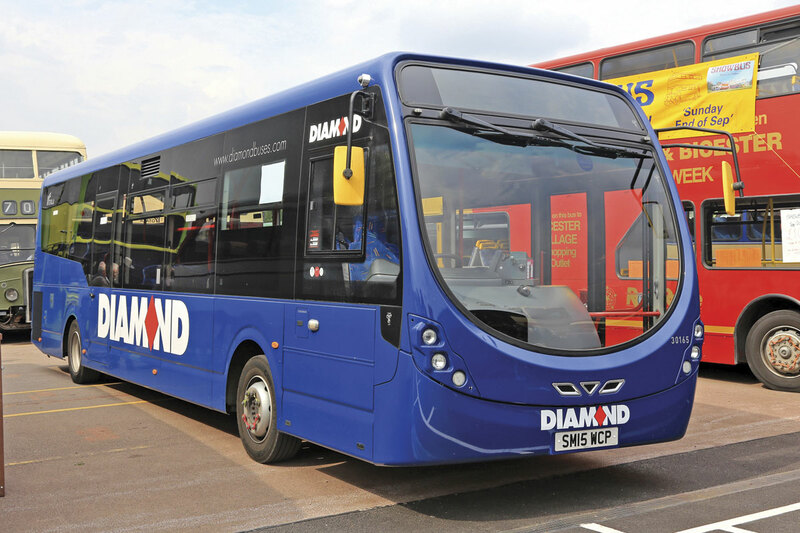 In a location where many icons of speed are displayed, the appearance of Reading Bus’ ADL Scania gas powered ‘fastest bus in the world’ was appropriate, whilst one of Travel de Courcey’s electric Optare Versas demonstrated the industry’s technical innovation. Contrasting with the usual UK vehicle designs was a 1970s Bedford Village Bus from Cyprus, complete with a variety of household paraphernalia on the roof. It appears to have spent some subsequent time in the Netherlands as the superb restoration job included notices in Dutch. 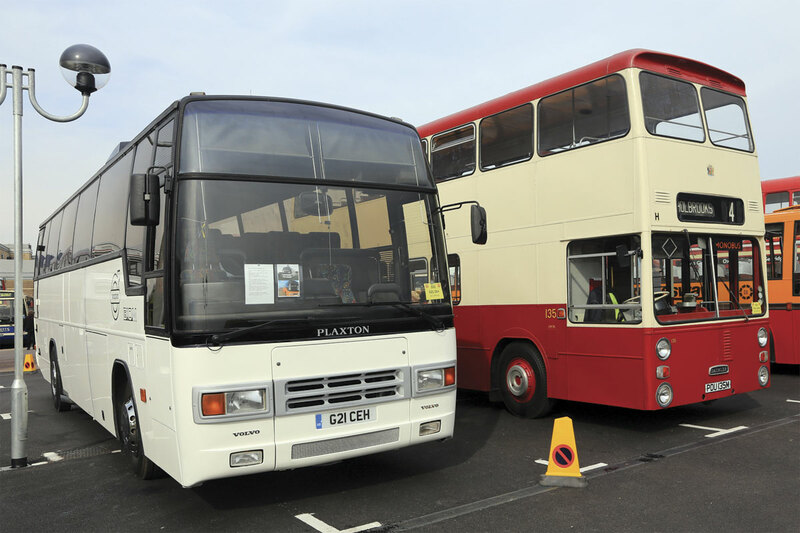 The international compliment also included an Expressway liveried Leyland Leopard from the CIE fleet in Ireland, one of a number of restored coaches which deserved a closer look. 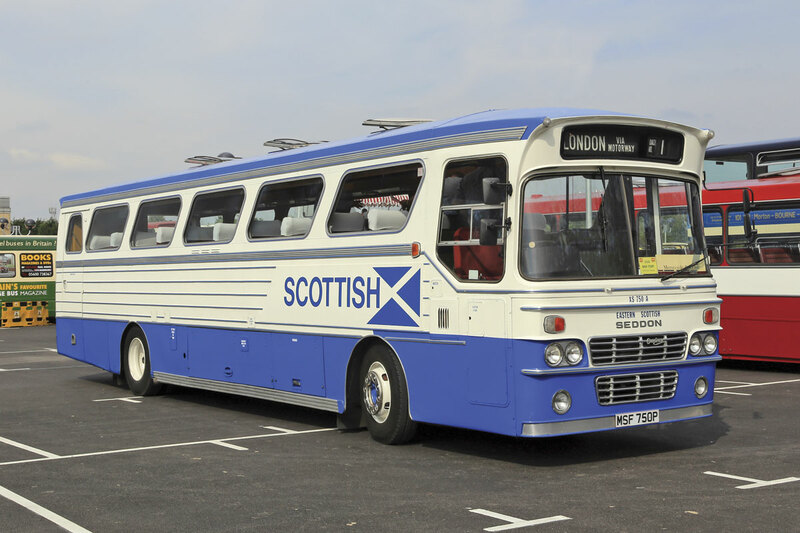 These also included the Alexander M type motorway coach with trapezoid windows on a Seddon Pennine VII chassis in Scottish Saltire livery entered by the Merseyside Bus Club and a 1990 Plaxton Paramount bodied Volvo B10M restored for its current owner by Cobus and now representing a Volvo demonstration vehicle. The displays at Buses Festival were complimented by a three route heritage vehicle service departing from outside the HMC building. Route one provided a link around the site saving the uphill walk to the car park, route two headed up the B4100 to a convenient turn back point at the Fosseway whilst route three provided an attractive 13 mile tour of local villages. Mid afternoon, after the first storm, proved a popular time to sample route three with the scheduled Greater Glasgow Leyland Atlantean duplicated by a Bristol RE from the Ulsterbus fleet. 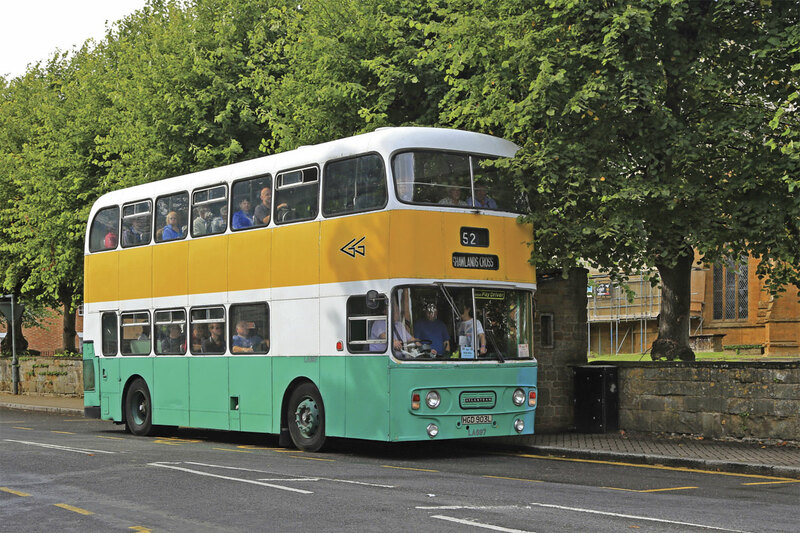 Kevin Carroll’s LA697 is a stalwart participant in events across the south of England and exudes the atmosphere of the Glasgow bus of the 1970s. Heading out from the HMC, the scale of the new access road works to serve JLR and Aston Martin was apparent from the top deck. Hopefully these will solve the tailbacks onto the M40 which have developed as this new centre of the UK motor industry has grown. Once through Lighthorne, the route turned off the B4100 onto the Fosse Way, encountering the first of several steep hills. Warwickshire is not normally thought of as a hilly county but the Roman practice of straight roads leads to a series of short sharp climbs requiring the well laden Atlantean to drop down the gears several times. Significant large vehicle power to weight ratio improvement was still some time away in the 1970s. Off the Fosse Way with its far reaching views across Warwickshire, the route passed historic Compton Verney and entered Kineton passing the former Stratford Blue bus depot now used for other purposes. After a short photo halt outside the village church, the journey continued through extensive road infrastructure works marking the beginning of a significant expansion of the town before arriving back at the HMC and the return of the sunshine. Kevin was one of a number of attendees making the most of their heritage vehicle. The Hogan brothers from Redditch also participated on the routes with their Bristol RELH coach which is used for family outings most weekends. 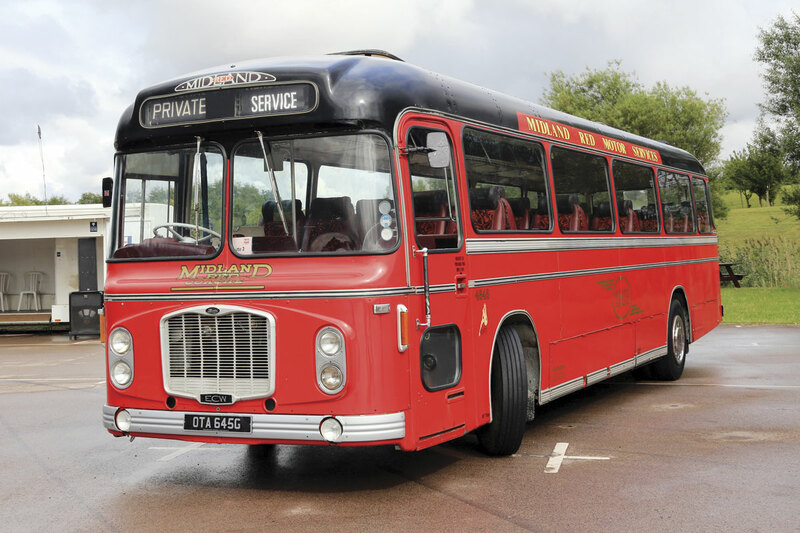 The vehicle carries Midland Red livery reflecting its previous ownership by Ashley Wakelin’s Midland Red Coaches operation. 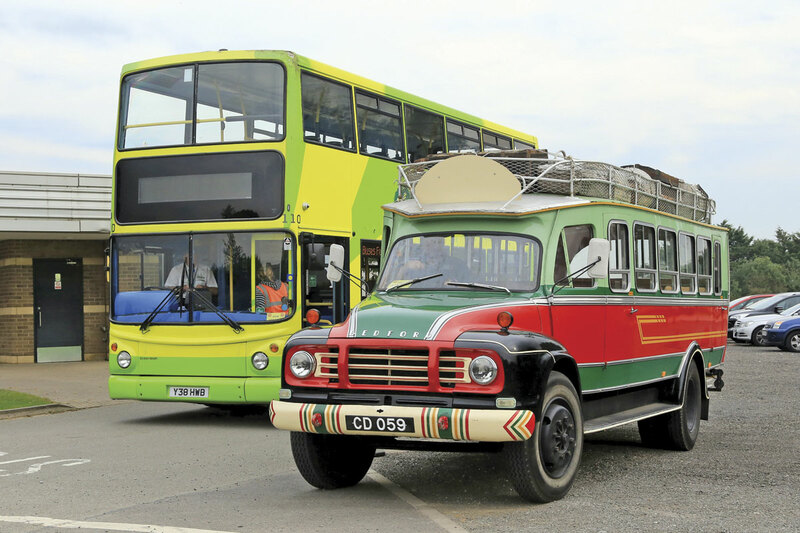 Despite closing the business and nominally retiring, Ashley himself was present at Gaydon with his latest venture, an open top MCW Metrobus previously used on Harrod’s sightseeing tours and superbly presented as an afternoon tea location vehicle. The date of 21 August 2016 has already been set for the third Buses Festival. By then, the access road works should be complete and the new HMC collections centre on site open to further increase the range of attractions. Whether there will be summer weather in 2016 is another question!